Since the human expansion began, we have always cleared some forest for our needs. Biodiversity remained. With agriculture, larger areas were cleared for our domestic plants and then we found we needed industry. With the recent advent of opencast and cities with dormitory cities, the woods with which we might have grown up are finally lost. Whereas developed countries have recreational forest, none of this is ancient in many countries. Biodiversity has been lost. Only well-wooded regions such as Sweden boast some original species mixtures, while the lucky Americans of both hemispheres have only been destroying their habitats for a few hundred years. For thousands of years, only forests that could be used for hunting or some royal pastime or other were preserved in any rational way. The "New Forest" of William the Conqueror is now the oldest forest in England, while true ancient forest, such as the Americans have, is restricted to truly tiny areas in the far north of several countries. Mountains unfortunately don't support large trees, otherwise we could count on high areas for some protection from us. Europeans tended to live originally on hills to avoid the lowland forest, so we decimated even those few high places that could have been conserved in modern times. Later, in the 15th century, the tree was the basis of all of that magnificent colonisation and warring on every continent, by virtue of naval power. (6000 oaks per ship were required by Nelson's navy.) There is no point in blaming our ancestors. Whether we can rebuild forest in a natural state is doubtful in many regions where so many species of fauna and flora have been lost. By far the most serious aspect of deforestation is the destruction of tropical rain forest, where crops can quickly provide profit. The trees can also be profitable of course, as in Indonesia where toilet paper is being made from trees, removing the last refuge of Sumatran tigers there. Really valuable trees such as teak have been replanted in some countries. Thailand has many new golden teak plantations. This hardly compensates for the sites that can be seen as you fly over the remnants of rainforest. Everywhere, oil palm and industrial farming is taking the pristine plants and their attendant rare animals. The Amazon is the largest example of sheer exploitation. With the murders of Mendes and, recently, Ribeiro, apparently by ranchers, in nature reserves in Brazil, the take-over by large scale farming, loggers mining corporations and ranchers is inevitable unless the powerless government changes. It seems that deforestation is more about politics than any other conservation issue. When first brought to notice, the response to deforestation was to reforest areas, not always in the same place. The afforestation was often unsuitable, with Sitka spruce where Scots pine had been taken and varieties that local organisms could not adapt to. Very few animals live in some of the dark, dense forestry projects in some European countries. Habitat has been lost forever. Ancient forests and the huge trees that dominate them still remain. Unfortunately their only role seems to be in a small national Park, preserved rather than conserved as a large ecosystem. Scotland still has stands of ancient pine that are nostalgic to view. All the native species that survive there remind you of a tropical forest. But these few stands are being enlarged slowly so we may gain back the forest that wild areas deserve. The Countess of Sutherland long ago condemned her crofters to poverty and emigration (to America), but she also condemned her own trees, with the introduction of the industrial farming of the 19th century - sheep! Elsewhere, these lessons have to be learnt. The few remaining large trees in South East Asia can be seen standing, lonely, in mountain areas, with National Parks attempting to protect them. But if you build a golf course nearby, will you attract more Japanese tourists? Perhaps the worldwide regulation of natural areas is the only imaginable, but draconian solution. Loss of trees to desertification (and heavy soil erosion as a result) is a problem not confined to the usual African Sahel examples. Water shortages on every continent are building up, and Africa cannot expect to regain desert, once lost. Trees of course make for a much damper climate, the water being essential both for us and the rest of the environment. The loss of rights for people is an alternative to this loss of this planet's resources on such a gigantic scale. With the intrinsic global warming implied by such destruction of carbon, international action is already forcing replanting as carbon offset programmes. More trees and their forest soils especially, absorb more carbon and store it long-term. This is termed biosequestration, as described in the landmark Kyoto Protocol. We also need to study how each tree, in each habitat influences other species and the whole environment. Mangrove species are a unique but salutary example, where such worldwide losses have occurred, that, in Senegal, 6 million have been planted. 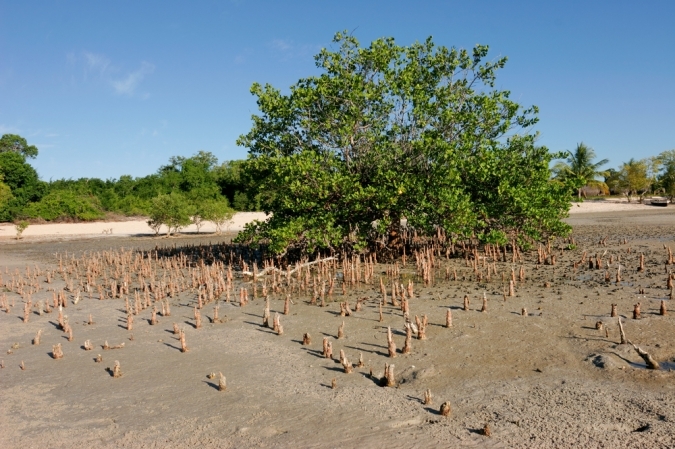 This preserves coastal villages that have long been protected by the maritime mangrove.